“People don’t buy from clowns.” The famous quote from Claude C. Hopkins may have been true in 1923, but times have certainly changed. 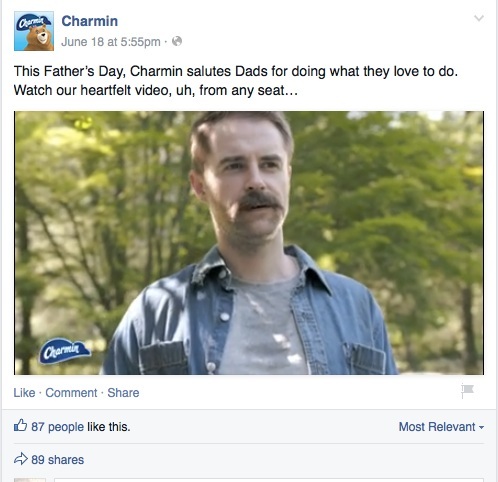 Some of the biggest brands in the world use humor to sell their products on social media. We all love a good laugh and when we’re choosing who to follow on Twitter or Facebook, brands that make us smile are usually at the top of the list. In fact, entertaining content is one of the top five reasons people follow particular brands or individuals online. Incorporating humor isn’t for everyone and can seem like a risk for your business. Done right, though, a few laughs can bring big benefits to your social media presence, and your bottom line. Humans love to laugh. Laughing can interrupt a bad day, break through an awkward moment, and help connect us to others. There are countless why your audience will respond well to funny content, but how will this help you and your brand? 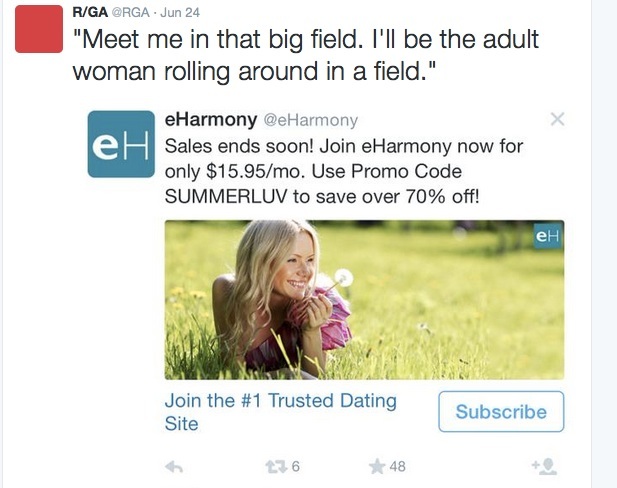 R/GA is a New York-based creative agency that is one of the sassiest brands in the Twitterverse. They consistently offer quick-witted replies and clever posts that make you stop, think and have a chuckle. They’re also not afraid of making fun of their industry, which not only brings a smile to your face, the confidence also helps to establish them as a leader. There are some online ads that are so funny you may not initially remember the brand, but you remember the message. If something makes you laugh, you’re more likely to share it and remember it when it comes time to make a purchase decision. An astounding 72% of individuals who follow a brand on social media are more likely to make a purchase. Take advantage of these numbers by being memorable; even if the content doesn’t directly relate to your brand, your message can still tie back to your brand identity in tone and delivery. Old Spice’s social media team doesn’t let a single post go out that isn’t 100 percent in line with their world-recognized brand. In the example below, they don’t even mention Old Spice or anything about their products, but it still works because it’s funny and memorable and completely in line with their brand identity. When we laugh or smile, we release neurotransmitters in our brain called endorphins. Endorphins are responsible for making us feel happy and they also help us to manage stress levels. Letting out a good laugh allows us to release negative emotions that can affect our overall mood, leaving us happier and in a more relaxed state. When a brand makes us smile, we feel connected in the same way we do when we’re having a good time with our friends. 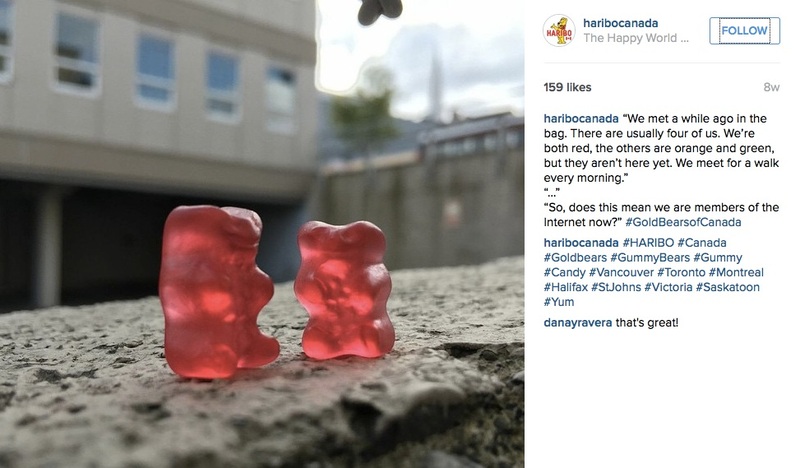 Haribo Canada takes a spin on ‘Humans of New York’ with #GoldbearsofCanada and gives a voice to their famous gummy bears. Giving the bears a voice is not only amusing, but it also makes you feel oddly connected to the lives of these little gummies. Their followers agree, as these images receive some of the highest number of likes on their Instagram page. Humor allows you to showcase the more relatable, human side of your brand. 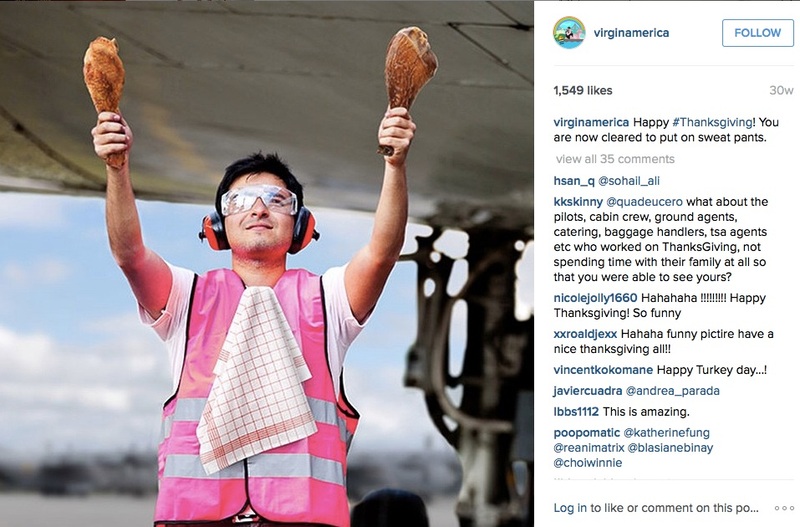 Virgin America does this well on their Instagram page. They often feature their staff on holidays like Halloween or Thanksgiving, being themselves, and being playful. Showcasing the people who work for you in an fun way can be a great way to increase company morale and also allows your customers and followers to feel connected to you on a personal level. So you’ve decided you want to incorporate humor as part of your social media strategy? This is going to be fun! But there are a few things to consider before getting started to ensure you’re doing things right. Your social media manager or team might think something’s funny, but can your audience relate to it? The funniest piece of content is only valuable if it speaks to your core fan base. Denny’s knows their younger demographic, and when Gucci Mane followed them on Twitter, they were ready to take advantage. The result? Over 1000 favourites and 800 shares on the platform. Humour is a great icebreaker and a great way for fans and followers to relate to you and your brand. 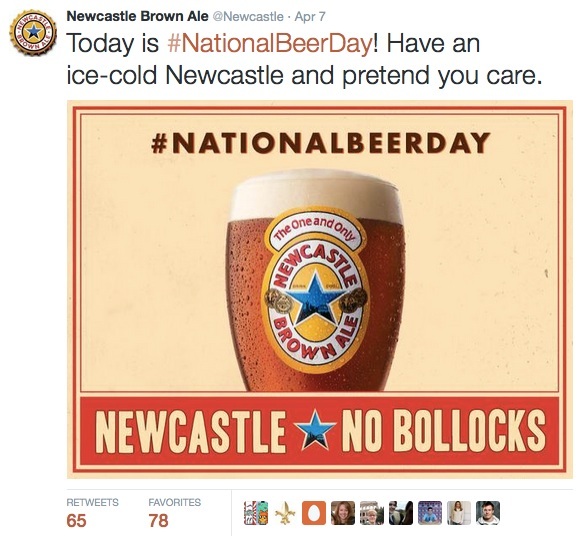 Newcastle Brown Ale does a great job in saying what everyone else is thinking, even before you know you’re thinking it. Big events (like the Superbowl) or holidays are a great time to inject a little humour into your social media account. Considering your brand and audience, look for opportunities around popular events and hashtags to get your humourous post noticed. 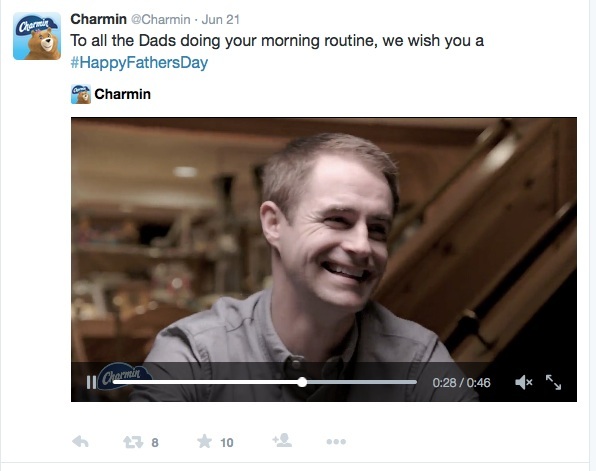 Charmin did this perfectly with their post for Father’s Day. They created a video catering to dad’s “morning routine”. The video featured various plays on bathroom humour that showcased the brand and also made you laugh. They extended the reach of their post on Twitter by using hashtag #HappyFathersDay, and made sure to leave the hashtag off of the video when they shared it to Facebook, keeping each post perfectly crafted for each individual platform. Does it seem like too big an investment bring the funny with your own content? You can still include the LOLs by way of a sassy or witty reply. Taco Bell does this constantly, and they do it well. Deciding to be funny is one thing, but are you funny? If you want to make an impact on social media, you need to ensure you’re hiring the right team of writers and creatives. Job postings are popping up regularly for skilled comedians and comedy writers for brands. Writing some funny Tweets seems like an easy job, especially when you see some of the simple copy from big brands, but coming up with content that is topical, onbrand, witty without being controversial and aimed at your audience is not an easy task. When choosing the people to build your social media team, it’s important to consider your brand’s voice and choose the right individuals for the job. There are also content suggestion tools available to help you create the best content for you. Have you created a perfectly hilarious Facebook post or Tweet? Don’t forget to use social advertising to your advantage. Investing just a bit of your advertising budget towards your content can significantly increase the number of people viewing your post. If it’s as funny as you think it is, investing in its reach makes sense. The reach and success of your post depends on the demographic you’re targeting and how much money you’re willing to invest. Being funny means often walking a fine line between entertaining and offensive. Making people laugh can come with major risks for brands. Over the years, we’ve seen some PR nightmares unfold over a simple Tweet or YouTube video. The Tweet was later deleted and an apology was posted stating that they were simply trying to “make light of a serious situation.” Learn from their mistake and put some process in place to make sure you don’t end up apologizing for an off-colour comment on social media. What’s is my audience paying attention to on social media right now and how will this land in that conversation? If people don’t really get the joke, how bad am I going to look? Is this right for the brand voice and tone? As Facebook CEO Mark Zuckerberg said, “The biggest risk is not taking any risk… In a world that’s changing really quickly, the only strategy that is guaranteed to fail is not taking risks.” He wasn’t talking about cracking wise on social media, but the principle applies. The social web is becoming a noisier place, and it’s a challenge for brands to connect with an audience. If you’re always playing it safe on social, you’re might be taking an even bigger risk: irrelevance.